Reggie Fils-Aime wasted a fair bit of our time on tech demos before making any actual game announcements for the Wii U console. Finally, after what seemed like an eternity, Nintendo has announced that Travellers Tales will be bringing a whole new LEGO adventure to Nintendo products with LEGO City Stories. Details are, predictably, sparse. 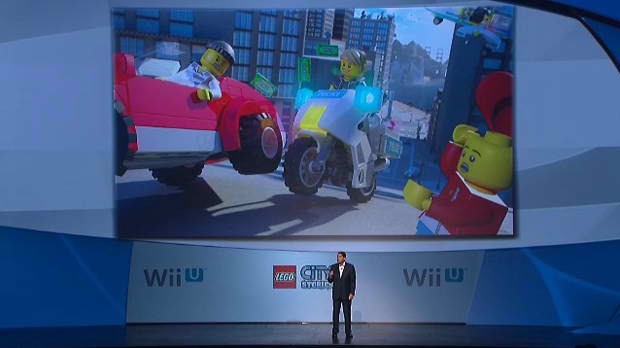 LEGO City Stories is a sandbox game coming to Wii U and 3DS. And that's about all we know just yet -- the footage showed a GTA-like mini-map. I think we can expect zany antics and family-friendly humor. Nice to see that Travellers Tales opening up into some new gameplay for the well-worn LEGO formula.